Short-stay parking (<24 hours): 350 kwanzas per hour. Long-stay parking: 8400 kwanzas for each started day exceeding the first 24 hours. Loss of the ticket: 25,000 kwanzas. Subscriptions are granted to regular users of the airport car park: 25,000 kwanzas for ten days and 75,000 kwanzas per month. 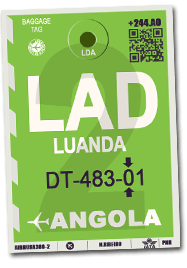 Many taxis are available 24 hours a day at Luanda International Airport. Several options are available to you depending on the expected comfort and the price that travelers are willing to pay. All taxis in Luanda have a meter but it is imperative to agree on the price before entering the vehicle because the pick-up rate and the kilometric rate may vary depending on the time of day, the destination and the type of taxi. You have the choice between taking a taxi in the official airport line and leaving the car park to take a taxi on the public road. We recommend the first solution that ensures you a respected price and the absence of surprise. The average prices for a ride from the airport to the city center (Largo do Lumeji) is 4000 to 5500 kwanzas. You can also opt for a more comfortable transport with a TNC. Several companies offer indeed, on reservation (telephone or application), a personalized welcome service at the airport. TCUL (Transporte Colectivo Urbano de Luanda) buses run around the interchange in front of the airport car park. Stops are 21 de Janeiro Avenue (east side of the airport car park, in front the the freight terminal) and Revolução de Outubro Avenue (towards the city center). Baggage transport can be problematic. The price of the bus ticket is 50 kwanzas. If you are staying at a hotel, ask them if a shuttle is available to guests. Several car rental companies offer their services in Angola. Some of them have an office in Luanda International airport where to pick-up your car 24h a day and others provide you with the car on your arrival.